I'm on 195 Prisms with roughly 1.5 million HC's..... Should i reset? I'll have about 1.8mil afterwards... or is it more worthwhile waiting it out till Bicentennial? Eh, you should be able to get Bicentennial quite easily at this point. Pay attention, Temporalfluxxx, 195 isn't "nearly there" it's half way there! I guess if you include the cost of 200ACs and the other buildings you're maybe 55% of the way there. You're about 3-4 days of active play away (if you play actively like I do). I'd say it's worth it. Got Bicentennial (back) a couple of days ago. Will reset at 2 million HC to go for the cursor achievement. If you are talking about the 400 one, don't bother. Well, it's not like I have anything better to do. Currently going for 4M chips and aiming at the cursor achievement. It might take a while, but seriously, what else am I going to do with all these imaginary cookies? Get as many HCs as you can before the prestige update. Get as many HCs as you can before the heat death of the universe. I'm thinking in just about a month, I've started playing a bit more actively lately, aiming to reset when I have enough for 1m chips this reset, then 1.25m chips, then 1.5m, then I'm going to go for Bicentennial. Might be slightly more then a month, but not more then 1 1/2. Couldn't hold out for my goal of getting 1 million cookies chips with the reset; finished the run at 362 hours total (almost 7 days post-Bicentennial) and made 920k HC, for a new total of 2.427 Million HC. The new run is already amazing. Combined with some serious mojo (three FCFs in two hours), I'm already looking at Plancking within the next hour or two. Up to 191 AC already. Just wish I had some other milestone to look forward to rather than the distant 400 Cursor achievement... speaking of which, when do people plan on starting to climb THAT mountain? 2M HC, 196 prisms, a hundred Sx or so in the wrinklers. A day or so more, I think. Depends on how much I'll play. I don't like overly long sessions. 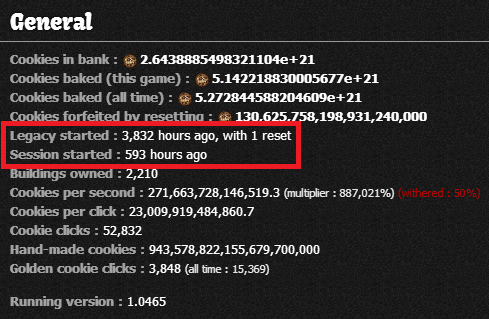 My current session started 326 hours ago :O Though yeah, 77 resets. 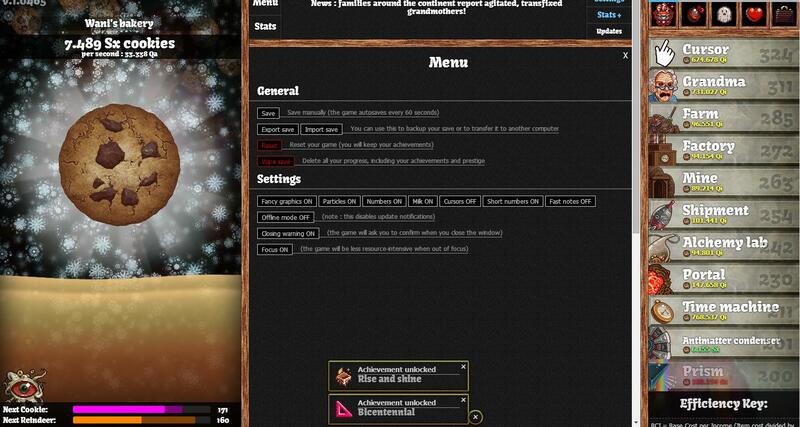 Also, 198 prisms now, with just under 10 Sx in the bank, and 69 Sx cookies saved in wrinklers. Nearly there! About a month to go for me. I think I may actually go for Bicent this reset. I'm at 1mil HC's, and my goal was for 1.2mil chips, but that's 200Sext, so it's just 250 more after that. Once I get the Bicent achieve and the upgrade for 200 prisms, I'll probably just let it go until I earn enough chips to double my current HC's. Once I get the Bicent achieve and the upgrade for 200 prisms, I'll probably just let it go until I earn enough chips to double my current HC's. Which likely won't take too long. I hit Bicentennial when I had 1.5 Million HC, and a week later (4-5 days active playing) I had over 900k more when I reset. A few days longer and I would have doubled my HC. I have 630K HCs and 176 prisms and I'm getting bored... it'll take forever to get those prisms and it's no fun. I'm running out of patience. I may simply stop playing. You're just two resets away, you can't give up now! It will forever torment you if you stop!